This NASA image of human-made lights is astonishing. This is what Earth looks like at night. Where are YOU located? 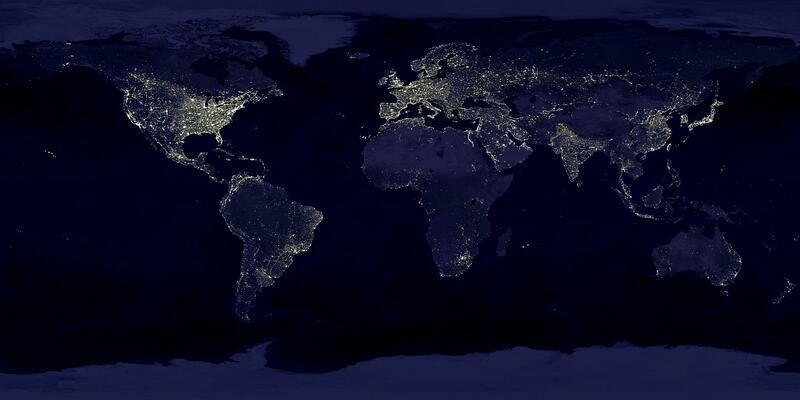 Human-made lights are concentrated on developed or populated areas of the Earth's surface. Notice the "lit up" seaboards of Europe, the eastern United States, and Japan. Also notice that many large cities are located near rivers or oceans, which facilitates trade. Particularly dark areas include the central parts of	South America, Africa, Asia, and Australia. This image is a composite of hundreds of pictures made by orbiting satellites. Sure, it's beautiful. But most people do not realize that lighted buildings cause special trouble for night-flying migrants. Marc Imhoff, a biologist at NASA's Goddard Space Flight Center, is one of many concerned scientists. For the past six years, he and a team of researchers have been looking for ways to measure the effects of urbanization on the biological productivity in the U.S. and other countries around the world. They made maps using satellite images of the world's lit-up cities at night. With these city light maps, researchers are zeroing in on the impacts of urban growth on the food we eat, the air we breathe, and the ecosystem within which we live. Courtesy of Fatal Light Awareness Program. Navigating primarily by the stars, night-migrating birds become disoriented by city lights. They confuse the billions of human-made lights in tall city buildings with starlight--especially in foggy or rainy weather, and especially after midnight, when the birds begin to descend from their peak migration altitude. Once disoriented, many birds collide with the buildings and fall to the sidewalks below. Others, like moths attracted to light, flutter around the lighted windows until they are exhausted. 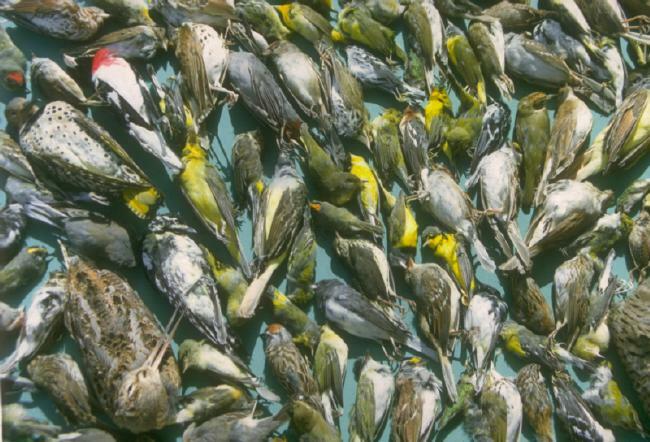 Birds by the hundreds and even thousands can be injured or killed in a single night at just one building. The problem is greatest in cities along flyways and along large bodies of water (such as lakeshores or rivers), which birds follow during migration. Many song birds evolved migrating at night, when predators retire and winds die down, and human-made lights interfere with nature's ways. To find a solution to the night lights problem in his city, Toronto artist Michael Mesure founded an organization	called FLAP (Fatal Light Awareness Project ) in 1993. FLAP asks cities to extinguish all interior building lights and non-essential outdoor lights, especially all flood lighting during migration time, and to shield essential lighting. During spring and fall bird migrations, teams of FLAP volunteers wake up before dawn. Equipped with bags and nets, they rescue the birds on the sidewalks that are still alive. They protect the birds until they recover, then send them on their way. Most mornings, volunteers find many birds on the sidewalks; if there's been bad weather, they may find hundreds. Before FLAP began its efforts, dead and dying songbirds were just swept up and put in garbage bags--sometimes still	alive. Volunteer patrols regularly begin at 4:00 A.M. Why so early? Because they must rescue the birds before the gulls, cats, raccoons and other predators arrive for an easy breakfast. Song birds diminish while scavengers thrive. Toronto is one city that's doing its part. During migration, the Toronto skyline will be darker because over 80 buildings have agreed to participate in the "Bird-Friendly Building Program." This certification program was launched by FLAP and World Wildlife Fund Canada. A manager of each coordinates the program and encourages office workers to turn off their lights before leaving and draw their blinds. These buildings have earned the right to	display the official "Bird-Friendly Building" logo. The November 2000 issue of Architecture Magazine reported that Chicago's Hancock Center has doused its ornamental nighttime lighting so save the nearly 1,500 birds that die each night when they crash into the tower during migration season when they mistake its lighting for stars. Will officials at the Empire State Building follow the example? What about officials in charge of tall, lit-up building where YOU live? Are the Buildings in YOUR City Bird-Friendly? Are birds colliding with buildings in your city? Are you on a flyway, or near a large body of water? Contact your local wildlife rehabilitation center. They may know if many songbirds are found in your city during migration, and also if there is a "Bird-Friendly Building Program." Learn as much as you can about night migrators and artificial light. Find out how you can help make your school, office, and home Bird-Friendly. Then be a friend to birds! Raise awareness of the problem by discussing it with family and friends. See links to related stories at FLAP (Fatal Light Awareness Project). Close your curtains and blinds at night. Visit eLights.Com and learn about bird-friendly lighting fixtures that cut glare, reduce sky glow and eliminate wasted energy dollars. Bird-friendly laws about lighting would be a wonderful gift to the future. Visit FLAP's Web site to read more. Then let your congressional representatives hear from you about the importance of bird-friendly legislation!